Department. Eligible candidates can apply online from 15-02-2016 to 14-03-2016. 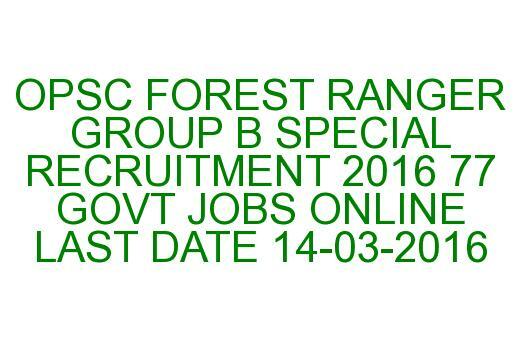 There are 25 posts are reserved for the candidates of OPSC Forest Ranger Recruitment. Please see the below furnished details for more details of age limits, pay scale and exam pattern etc. 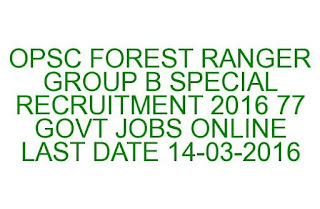 Click here to see the official advertisement of OPSC Special Recruitment of Forest Ranger. There are total 77 vacancies available in Orissa Forest department. For the candidates Schedule Tribe who are having B. Sc degree in Forestry for them 29 posts are reserved. Out of 29 posts 10 are reserved for the women candidates. And other 28 posts are reserved for the Bachelors degree candidates of other than forestry. In which 9 posts are reserved for women. For the candidates Schedule Caster who are having B. Sc degree in Forestry for them 20 posts are reserved. Out of 209 posts 06 are reserved for the women candidates. And other 10 posts are reserved for the Bachelors degree candidates of other than forestry. In which 3 posts are reserved for women. The candidate must have qualified degree in any one of the Science Subject as main subject. Mathematics, Physics, Chemistry, Zoology, Botany, Geology, Veterinary Science, Animal Husbandry and Forestry are any one of the subject. Age limits for this special recruitment is 21 to 37 years. Selection for this ODISHA Forest Ranger recruitment is held in three stages. There is no examination fee mentioned by OPSC in the official advertisement. Examination will be conducted for 1400 marks with 60 minutes duration. There are total 6 papers for this written examination. Two compulsory papers and one 4 optional papers will be available. For complete details regarding the optional papers please see the official notification. Height for men 163 cms, for women 150 cms minimum. Chest for men 84 cms on expandable 89 cms. Female candidates have to clear 16 kms in 4 hours. The eligible candidates can apply online through the official website of www.opsconline.gov.in. Before filling application form online please read the official notification and user instruction carefully. Click here to apply online for the ODISHA Public Service Commission Forest Ranger Recruitment 2016. Please share this ODISHA Forest Ranger Recruitment 2016 article to your lovable friends through online via social web.